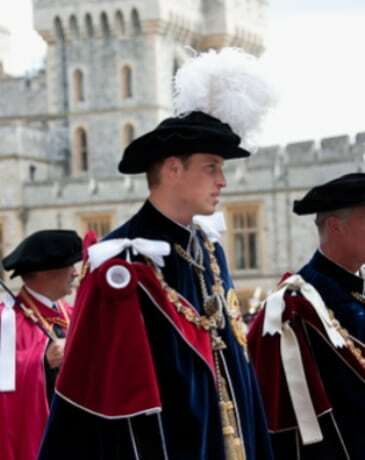 Prince William is shown wearing the robes of a Knight of the Order of the Garter. 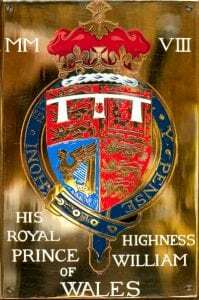 He became the 1,000th Knight of the Order on 16 June 2008 when he was invested in the State Apartments of Windsor Castle by The Queen. Later that same day he was installed in his stall, or seat, in the Quire of St George’s Chapel. 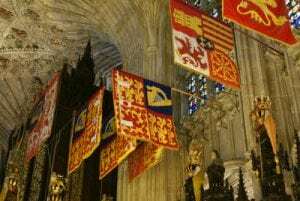 His banner and coronet are displayed in the Quire as are those of all living Knights of the Garter. Attached to the back of Prince William’s stall is his stallplate; in the Chapel there are almost 800 of these stallplates which stay in place after a Knight dies. They range in date from the 14th century to the modern day. For more information about the Royal Family and the Order of the Garter please click here. Prince William was confirmed in St George’s Chapel in 1997. Since then he has attended various services including the service of dedication and prayer following the marriage of The Prince of Wales and The Duchess of Cornwall in 2005. For a list of Royal weddings that have taken place in St George’s Chapel click here. For an archives blog about the 1863 wedding of the future Edward VII when Prince of Wales please click here. On 29 April 2011 the bells of St George’s will ring out from the Curfew Tower to mark and celebrate the wedding of Prince William and Miss Catherine Middleton. To hear an example of the bells in action please click here.